EVO is a subsidiary of Smooth Fitness. EVO home treadmills are not too widely distributed among retailers like their other brand – Smooth treadmills. However, they are usually available online. EVO treadmills typically range from around $1,100 all the way to $3,500 when they are purchased brand new. Below, we will feature a thorough review of EVO treadmills. Some of the EVO treadmills on the market feature top end motion sensor controls on their handrails. These are the kind of features that are not only innovative but useful for treadmill users. 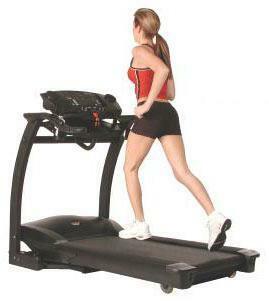 With the wave of the hand, a treadmill user can instruct the treadmill to either slow down or speed up. Those that like to run on their treadmills find this feature very convenient because messing with buttons while you are in full stride can be difficult and dangerous. EVO treadmills are some of the most feature advanced treadmills on the market when it comes to their control options. Another huge benefit to EVO treadmills is the fact that they place so much emphasis on reducing the amount of shock in the treadmill by installing different advanced cushioning materials on both the handrails and the frame. This means that the shock is essentially displaced from the treadmill user’s body to the frame of the treadmill. Each of the different EVO models feature a minimum of a 2.5 horsepower motor. This means that it is going to be sufficient for just about anyone’s usage including both walkers and runners. The warranty that comes with most EVO models are going to be lifetime warranties on the motors and the frame. This means that if you ever have a problem with either of these parts of the treadmill, you are going to be covered. The other parts of the treadmill are generally going to be covered for around 5 years and you are also going to get one year of labor coverage. Therefore, it comes with some of the best warranties in the business. EVO stands behind their products fully and it shows in their warranty policies. This is good for anyone that is looking to keep their treadmill for an extended period of time. EVO makes a lot of different kinds of treadmills. A lot of their market options include one of a kind features and a ton of different variety. Some of them have truly unique features that make the product stand out from the competition. One of the models actually can be folded to save space while remaining one of the sturdiest treadmills on the market. Whereas another has an extra long 62 inch track which is one of the longest available on the market. Therefore, you should be able to find a model that suits your needs within the EVO product line. They have a bunch of different treadmills that cater to all kinds of different users. The fact is, when you buy an EVO treadmill, you better be prepared to open your wallet. Because these machines are made of high quality materials and because they have such unique features, they are some of the most expensive treadmills on the market. The lowest end of the product line is still going to be over $1,000. Therefore, this might push the EVO product line out of the budget for some potential users. However, it is important to understand that usually with fitness machinery, you get what you pay for. And if you want to purchase a treadmill that is going to give you great results and that is going to last a long time, you will be hard pressed to find a better model than one from the EVO line. Most EVO models actually require a ton of complicated assembly. This means that the customers are going to have to assemble the product themselves which can become tedious and difficult for some users. This can be a huge turnoff for some people that simply do not want to deal with the assembly. However, customers can typically pay extra to have the product set up in their homes.